It's never too late to start living or learning. Such is the philosophy of Helene Thyrsted. The thirty two year old is presently completing her bachelor's degree in English and French at Aarhus University in Denmark. But her passion is the body positive movement, an online global community that extends beyond Denmark's borders. Helene's contribution to this movement is marked by her succinct nature. When she has a lot to say, her preferred medium is video. "I'm good at painting a picture with words and making myself understood," she says. 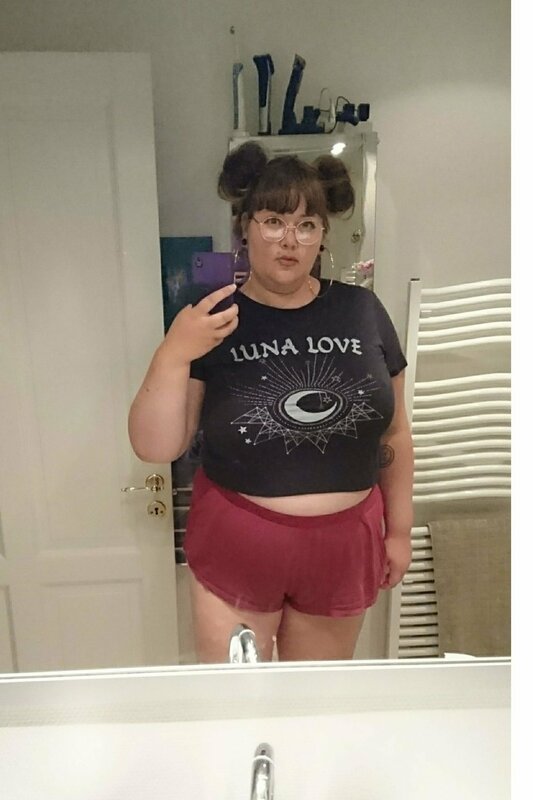 "I advocate body love, fat acceptance, mental health, and body liberation. Mostly through my Instagram account, but I also do interviews in real life as much as I can and as soon as anyone will listen." She hopes to give more talks soon, "possibly at high schools and other places of education." As a child, Helene was not exposed to nearly enough diversity. "I wish I had seen representation of different bodies, identities, and ways of living. More openness and tolerance. That's one of the things I fight for now." And a fighter she is. Being fat means that Helene has limited options. Why? "Because we're not a desirable demographic," Helene says. "That means I get to express myself less than others through fashion, not being visible in media and not getting the same career opportunities as a thin person. Numerous industries make lots of money, like dizzying amounts, on convincing people that they would be happier if they were smaller, took up less space. They sell us waist trainers, gym memberships, slimming teas, wraps, surgeries, diet plans, hunger suppressants, magazines, tiny models, tiny outfits. And we are programmed to believe them, and we buy it." Helene is involved in a Danish documentary about the body positive movement in Nordic countries. "I'm really looking forward to seeing how that turns out," she says. "I'm continuing to work on my relationship with my own body and mind. I can come off as very confident, when I am, in fact super unsure of myself inside." RS: Where can we find what you've created? HT: On Instagram, mostly, @ChubbyDane. I take lots of selfies, with or without clothes, showing body confidence and strength, but also moments of vulnerability and doubt. I try to stay as true to myself as I can on social media, and it seems to resonate with a lot of people, which is really cool. RS: What do you look for when capturing an image? HT: When I post a picture of myself, my thoughts are: do I like this picture? Will it get me in trouble, and if so, is it worth it? Does it have a purpose beyond aesthetics? (meaning, is it more than just "pretty" ? Does it have something to say?) Does it say something about me? The pictures are usually selfies, since I don't have anyone to take my picture all the time. RS: What are the main challenges? HT: One of my main challenges, personally, is breaking through to the "mainstream" and getting to tell enough people that there is an alternative to hating your body and trying to change yourself, without being misunderstood. Another challenge I face, when dealing with media, who often misunderstand or twist your words, is to never discuss or address matters that I don't know anything about. When a journalist starts asking me why I am promoting an unhealthy lifestyle, I must bite my tongue and instead of trying to lecture them on health, calmly say that I am not a health professional, so I am not going to comment and risk saying something that is untrue. HT: Definitely. I grew up in a large working class family, as the eldest of 5 children, and with an alcoholic father. So I learned very early on to take responsibility and think of the needs of others and not my own. I basically taught myself that I didn't matter in order to be there for my siblings and family. I also had a very deep hatred of my body, which contributed to the notion that I was worthless. RS: What’s an example of failure to you? HT: I am working really hard to learn that failure isn't a thing. But I feel like I'm failing in many situations and it's affected my mental health. I'm not a perfectionist, but I have an almost constant fear of not being good enough in everything I do, and that makes it hard to get things done, when you feel like you won't succeed from the beginning. It stresses me out a lot and is something I struggle with still, though I am going to counselling and meditation helps as well, when I remember to keep it up. RS: When was the last time you felt truly happy? Or frustrated? HT: Told the people I love that I was unhappy and needed help. HT: Lots of things. But one that affects me and my work the most is the beauty myth. RS: Any other remarks on your activism that you would like to share? HT: I guess my political views have made it easier to accept the idea that there is no wrong way to have a body. And body positivity and feminism are closely linked, so while I had a lot to learn, nothing clashed with the way I already saw the world. RS: What do you do when you feel down? HT: I try to be kind and gentle with myself, and I try to reach out to someone close to me, to feel less alone. Everyone close to me knows what I struggle with, and it helps a lot to be able to be honest and not wasting energy trying to pretend I'm feeling great when I'm not. RS: What does nature reflect to you? What kind of spaces do you like to dwell in? HT: Nature is wonderful. I spend most time indoors, but when I am out, nature makes me feel grounded and in touch with something bigger than me at the same time. I feel in place, now that I think about it, which is weird, because I often feel out of place. I enjoy spending time in wooded areas, parks, lakes, the ocean/beaches, fields. I like the city as well but in a different way. I live in an urban area and there I mostly like being in the library or in my home. I can enjoy being in stores when I go shopping, but the crowds can often make me feel stressed or even anxious. I like old buildings with soul in the centre of the city. I enjoy city living, but not necessarily the people. RS: What kind of people do you prefer to hang out with? HT: People I trust, and who make me laugh. And who laugh at me. Loyal friends who stand the test of time, while knowing the ugliest truths about me and vice versa. Shared interests and humour are probably a good place to start. But also a shared struggle. Actually, when I think about it, my strongest friendships have been ones founded in a shared struggle. I admire their loyalty, their tenacity, their love and compassion. RS: What are some of your favourite feelings? HT: I love being at my dad's and his wife's house. It makes me feel safe and at home. I love the feeling of being held by someone I feel safe with, and the feeling of light rain on my skin. The smell of rain is intoxicating as well, and of thunder as well. I've started burning incense after trying to meditate again and I just found one with sage, that I find really pleasant and not too heavy in the way incense often can be.